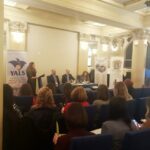 The First Regional Conference of YALS Association of Language Schools of Serbia, titled YALS and Eaquals Day: Striving for Excellence was held on 23 March 2019 at the Faculty of Philosophy in Niš. 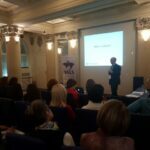 The conference was supported by the Eaquals Member Event Fund 2019 for local and regional events and a special emphasis was placed on networking and professional cooperation with the partner associations from the region – MAQS, Macedonian Association for Quality Language Services, which was represented at the conference by Buzalkovska Vesna and Tanevska Elisaveta, and Optima, The Bulgarian Association of Quality Language Services, represented by Ananieva Yordanka, Kermendjeva-Dimirova Nikolina and Kermendjeva Teodora. 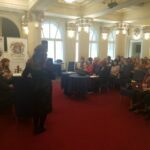 This event was also supported by the Faculty of Philosophy of Niš University, represented by Nina Lazarević, Assistant Professor at the Department of English. The overall theme of the conference were (extra)curricular activities aimed at increasing students’ and teachers’ motivation. 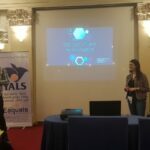 The conference was opened by YALS Chair Marija Pejatović, who introduced the values and principles that YALS members stand for and cooperation with Eaquals, after which she gave a short overview of past YALS activites. 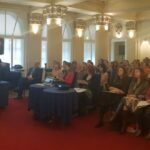 This was followed by presentations of 11 teachers from 5 YALS schools – Ivan Petrić, Tijana Rakonjac and Vera Purić from Blackbird School, Čačak, Danijela Beljić and Lora Petronić Petrović from Lingva School, Valjevo, Jelena Spasić from Oxford School, Leskovac, Marina Stošić, Katarina Kostić and Anđelija Ognjanović from Penguin School, Jagodina, and Jovana Popović and Sofija LJijljak-Vukajlović from Tom & Emma School, Belgrade. An interesting day – always good to broaden your horizons. Really useful seminar, I’ve enjoyed it. I’d love to come again. It’s been a real pleasure to spend this Saturday with you. This one was among the best YALS seminar ever! So many diverse ideas, approaches and so much dedication! 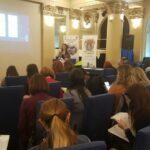 This entry was posted in News and tagged academic management, aktivnosti YALS-a, EAQUALS, ELT/ELL, Filozofski fakultet Niš, language schools, MAQS, obrazovni menadžment, OPTIMA, YALS activities, yals conference, YALS Serbia on 2019/04/01 by admin. It gives us great pleasure to invite you to the First Regional Conference of YALS Association of Language Schools of Serbia, which will take place on 23 March 2019 at the Faculty of Philosophy in Niš. The conference is supported by the Eaquals Member Event Fund 2019 for local and regional events and a special emphasis will be placed on networking and professional cooperation with the partner associations from the region. The Conference Registration Request and Programme are attached. You are kindly requested to register by 15 March 2019. The number of places is limited. All accepted registrations will be confirmed by email. 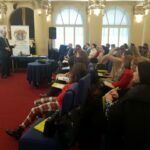 This entry was posted in News and tagged academic management, adult education, aktivnosti YALS-a, EAQUALS, language schools, obrazovanje odraslih, obrazovni menadžment, regional event, škole jezika, YALS activities, yals conference, YALS Serbia, yals srbija on 2019/02/22 by admin. 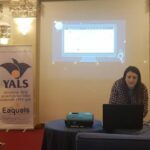 One more time YALS Annual Conference proposal, made by YALS Chair Marija Pejatović, has been accepted as part of the Eaquals Member Event Fund 2019 for local and regional events. 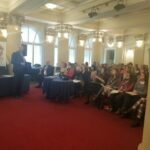 The Conference will be held in Niš this time, as a regional event with a special emphasis on networking and professional cooperation with the partner associations from the region. It is the third time that YALS is to receive funding from Eaquals and a clear sign that our efforts towards enhancing quality of teaching and learning continue to be recognized as consistent and effective by relevant European institutions. 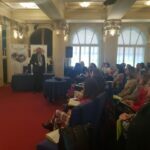 This entry was posted in News and tagged academic management, adult education, aktivnosti YALS-a, EAQUALS, ELT/ELL, language schools, obrazovanje odraslih, obrazovni menadžment, škole jezika, yals conference, YALS Serbia, yals srbija on 2018/12/12 by admin. 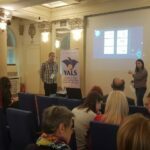 YALS Conference 2018 – From the Heart of England: Teaching Revisited took place at „Gvarnerius“ – Centre of Fine Arts in Belgrade on 24th November, 2018. 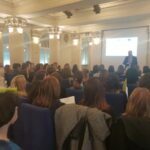 The Conference was divided into two main parts, one being the exchange of experience gained through the application for Erasmus Plus programme, held by Ljubomir Vasojevic, the head of Blackbird Language School, which is participating in the programme, and Mike Hogan, the representative of York Associates, the partner organisation, who talked about their experience as course providers in Erasmus + programmes. 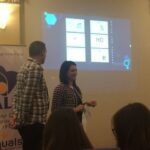 The other part of the conference was held by the teachers of Blackbird Language School who held workshops and exchanged the practical ideas gained through the project. Blackbird Language School became a partner organisation of York Associates after the mobility, as a result of good cooperation in the project itself. 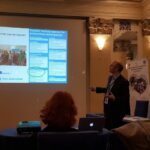 In the first session, Mike Hogan talked about ways of applying for Erasmus Plus programme, and their experience in the field. The session was marked as very useful by the participants, pointing out that the session provided good examples of practice and the insight into the courses York Associates provide. The second session was held by Ljubomir Vasojević. 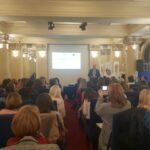 In the engaging and useful session, as it was marked through the evaluation questionnaire, Ljubomir presented the experience he gained with his team through Erasmus Plus programme, providing all the steps they took that led to the success of the project. 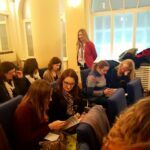 As the sum-up, participants were exposed to Panel discussion in which they could ask any questions to the presenters and to Maja Gavrilović, as a former coordinator of successfully completed YALS 2017 Erasmus Plus project. 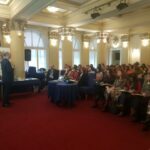 The participants of the seminar showed interest and enthusiasm for the future projects. 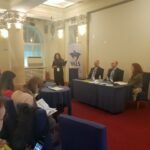 Panel discussion was led by Marija Pejatovic, YALS President. The session titled What Do We Mean by Culture? that followed was led by Mike Hogan, and it dealt with the importance of cultural awareness and the ways it can affect the communication. The participants gave positive feedback considering the presentation, the importance of the topic and effectiveness. 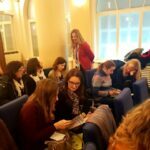 In the second part of the Conference, four teachers from Blackbird Language School, exchanged useful ideas and ready-made activities that teachers could use in their lessons. 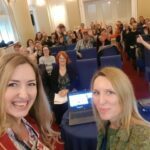 The first session was held by Milena Sredojevic and Marijana Ćendić and the topic of the presentation was Enliven Your Lessons, in which the presenters showed new ways of engaging students. The workshop was marked as highly useful and the ideas as applicable for the lessons. 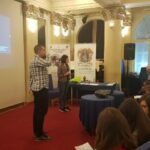 The second session was held by Ivan Petrić and Ivana Grujović, with the accent on the usage of technology in the lessons. 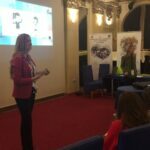 In their presentation The New Use of Technology, the presenters showed the usage of several applications and led the participants step by step through them. 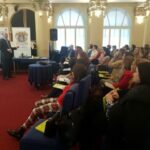 The presentation left good impression on the participants, who were engaged and interested in the activities, and the presentation was marked as very useful and practical. 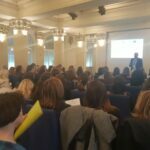 The overall impressions of the seminar were positive, with the accent on good organisation, choice of topics and well prepared speakers. 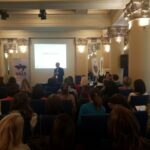 This entry was posted in News and tagged academic management, adult education, aktivnosti YALS-a, ELT/ELL, Erazmus+, language schools, Mobility Programme, obrazovanje odraslih, obrazovni menadžment, škole jezika, YALS activities, yals conference, YALS Serbia, yals srbija on 2018/11/28 by admin. 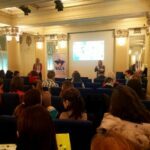 organised by YALS, the Association of Language Schools of Serbia and Blackbird Language School from Čačak as part of Erazmus + programme. The presenters will share their experience gained within the programme. “GUARNERIUS” – Centre of Fine Arts, Džordža Vašingtona 12, Beograd. Milena Sredojević, academic coordinator, and teachers Marijana Ćendić, Ivana Grujović, and Ivan Petrić, who took part in the project. 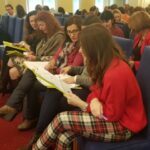 The lectures and workshops include experiences gained during organising projects within Erazmus+ programme, developing teachers’ competences, approaches to the theme of culture, aspects of teaching methodology and use of new technologies. The conference programme refers to Saturday from 10.00 am do 4.00 pm. We hope that you will join us and help make this conference a success. 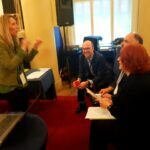 This entry was posted in News and tagged academic management, adult education, aktivnosti YALS-a, Erazmus+, language schools, obrazovanje odraslih, obrazovni menadžment, škole jezika, YALS activities, yals conference, YALS Serbia, yals srbija on 2018/11/07 by admin.